This is a beautiful hotel (I was lucky enough to be shown a couple of the rooms but despite my best efforts of trying to bed-down in there I didn’t stay). The restaurant is warm and cosy and even has private booths with curtains that go around it for the most special guest (Madonna maybe). Its a wonderful place to go for a couple of glasses of champagne or a gorgeous dinner. 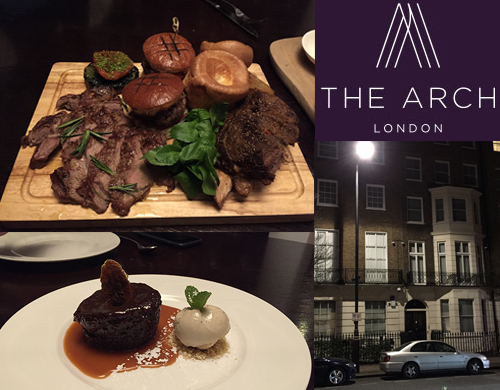 I dined on the Best of butcher’s board (rib eye with rosemary oil, mini burgers and braised short ribs £48 to share) and Sticky toffee pudding with caramelised banana ice cream (£6.50) for desert. I haven’t stopped dreaming about the meat since that night and I am aching to go back and have it again! And any restaurant that throws a couple of Yorkshire Puddings on the plate gets a massive thumbs up from me! If you fancy splashing out on a bit of luxury, or are looking for somewhere special to go with friendly service and great food, Hunter 486 is certainly a great option. I’m already planning my next trip!